Criminal justice is the delivery of justice to those who have committed crimes. The criminal justice system is a series of government agencies and institutions whose goals are to identify and catch unlawful individuals to inflict a form of punishment on them. Other goals include the rehabilitation of offenders, preventing other crimes, and moral support for victims. The primary institutions of the criminal justice system are the police, prosecution and defense lawyers, the courts and prisons. In the criminal justice system, these distinct agencies operate together as the principal means of maintaining the rule of law within society. The first contact a defendant has with the criminal justice system is usually with the police (or law enforcement) who investigates the suspected wrongdoing and makes an arrest, but if the suspect is dangerous to the whole nation, a national level law enforcement agency is called in. When warranted, law enforcement agencies or police officers are empowered to use force and other forms of legal coercion and means to effect public and social order. The term is most commonly associated with police departments of a state that are authorized to exercise the police power of that state within a defined legal or territorial area of responsibility. The word comes from the Latin politia ("civil administration"), which itself derives from the Ancient Greek πόλις, for polis ("city"). The first police force comparable to the present-day police was established in 1667 under King Louis XIV in France, although modern police usually trace their origins to the 1800 establishment of the Marine Police in London, the Glasgow Police, and the Napoleonic police of Paris. In the late 1960s, with the establishment of the Law Enforcement Assistance Administration (LEAA) and associated policy changes that resulted with the Omnibus Crime Control and Safe Streets Act of 1968. The LEAA provided grants for criminology research, focusing on social aspects of crime. 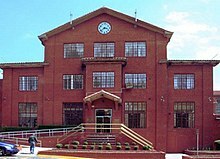 By the 1970s, there were 729 academic programs in criminology and criminal justice in the United States. Largely thanks to the [Enforcement Education Program], criminal justice students numbered over 100,000 by 1975. Over time, scholars of criminal justice began to include criminology, sociology, and psychology, among others, to provide a more comprehensive view of the criminal justice system and the root causes of crime. 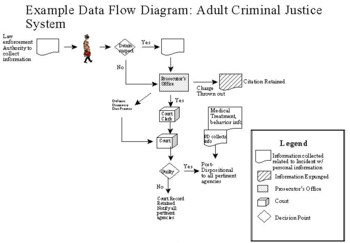 Criminal justice studies now combine the practical and technical policing skills with a study of social deviance as a whole. The first official criminal justice system was created by the British during the American Revolution, as they created the system to primarily justify hangings to the citizens of their government. In each selected area or/and district there was a magistrate that in today's time would be known as a judge. These individuals were in charge of determining if the Crown or also known as the British government had enough evidence to hang an individual for a crime. The British would not always hang an individual for committing a crime, there would also be trials for punishments that would be carried out by cleaning ships, prison ships, or be locked up on British mainland. During the American revolution the primary type of punishment was to be hanged or sent to prison ships such as the notorious HMS Jersey. 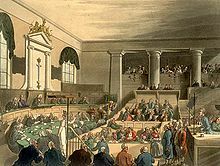 After the American revolution the British-based criminal justice system was then adopted by other developing nations (Such as the United States). ^ "U.S. Criminal Justice System Overview - CorrectionalOfficer.org". www.correctionalofficer.org. ^ Dinsmor, Alastair (Winter 2003). "Glasgow Police Pioneers". The Scotia News. Archived from the original on 2009-07-16. Retrieved 2007-01-10. ^ FBI (2009). THE FBI: A Centennial History, 1908-2008. Washington, D.C.: FBI. p. 138. ISBN 978-0-16-080954-5. ^ McElreath, David; Doss, Daniel; Jensen, Carl; Wigginton, Michael; Kennedy, Ralph; Winter, Kenneth; Mongue, Robert; Bounds, Janice; Estis-Sumerel, J. Michelle (2013). Introduction to Law Enforcement (1 ed.). Boca Raton, Florida: CRC Press. p. 87. ISBN 978-1466556232. ^ "We find that the percentage of favorable rulings drops gradually from ≈65% to nearly zero within each decision session and returns abruptly to ≈65% after a break." Shai Danzigera; Jonathan Levav; Liora Avnaim-Pessoa (11 April 2011). "Extraneous factors in judicial decisions". Proceedings of the National Academy of Sciences of the United States of America. 108 (17): 6889–92. Bibcode:2011PNAS..108.6889D. doi:10.1073/pnas.1018033108. PMC 3084045. PMID 21482790. ^ Perri, Frank S.; Lichtenwald, Terrance G. (2009). "When Worlds Collide: Criminal Investigative Analysis, Forensic Psychology And the Timothy Masters Case" (PDF). Forensic Examiner. 18 (2): 226972. ^ Perri, Frank S.; Lichtenwald, Terrance G. (2010). "The Last Frontier: Myths & The Female Psychopathic Killer" (PDF). Forensic Examiner. 19 (2): 50–67. ^ "Finest of the Finest". TIME Magazine. February 18, 1966. Archived from the original on 2008-10-14. ^ Wolfgang, Marvin (1990). "Crime and Punishment in Renaissance Florence". Journal of Criminal Law and Criminology. 81 (3): 567–84. doi:10.2307/1143848. JSTOR 1143848. ^ Garland, David (2002). "Of Crimes and Criminals". In Maguire, Mike; Rod Morgan; Robert Reiner. The Oxford Handbook of Criminology, 3rd edition. Oxford University Press. p. 20. ^ Terrill, Richard J. (2015). World Criminal Justice Systems: A Comparative Survey (revised ed.). Routledge. p. 32. ISBN 978-1317228820. ^ Dempsey, John S.; Forst, Linda S. (2015). An Introduction to Policing (8 ed.). Cengage Learning. pp. 6–8. ISBN 978-1305544680. ^ "Policing by consent". UK Government. 10 December 2012. Retrieved 29 December 2013.